The WCRC Facility Board and Amanda Tiffin hosted another successful JAZZ IN THE PARK event in April 2013, raising funds for the Health and Wellness Centre at WCRC. The Chris Burger Petro Jackson’ Players Fund donated funds to cover the cost of tents, gazebo’s and advertising. The WCRC CAUTI-task team presented a poster on ‘Early removal of urinary catheters in acute spinal injury to reduce catheter associated urinary infections’ ’at the 18th International Forum on Quality and Safety in Healthcare, London in April 2013 and participated in a podium presentation at the BCA conference which was held in association with HASA (Hospital Association of SA) and IHI (Institute for Healthcare Improvement) on 28-30 October 2013 at CTICC. “Civil servants keep our country working like a well-oiled machine and the important contributions that these hardworking people make to our families, our communities and our country needs to be acknowledged and recognized. It takes a special type of person to properly do that and not everyone is cut out for the job. Somayya Kolia is an Occupational Therapist at the Western Cape Rehab Centre and has committed her career to helping people with disabilities re-integrate back into society. Occupational Therapy has been defined as “the use of treatments to develop, recover, or maintain the daily living and work skills of patients with a physical, mental or developmental condition. Occupational therapy is a client-centered practice that places a premium on the progress towards the client’s goals. Occupational therapy interventions focus on adapting the environment, modifying the task, teaching the skill, and educating the client/family in order to increase participation in and performance of daily activities, particularly those that are meaningful to the client”. 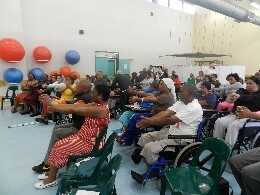 The global launch of the World Health Organization (WHO) Wheelchair Service Training Package Intermediate (WSTP-I) took place in Cape Town from 19 – 23 August 2013. This important event in the standardisation and professionalization of wheelchair services was hosted by Western Cape Rehabilitation Centre. 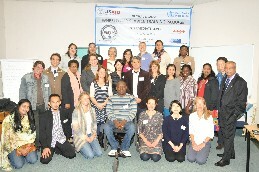 Twenty-one participants attended the training and represented 16 different countries around the globe including: Thailand, Mozambique, USA, Philippines, Argentine, Kenya, India, People’s Republic of China, Tanzania, Fiji, Romania, Korea, Sudan, Brazil and South Africa. 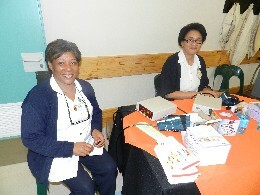 There was one person from Brazil who attended as an observer. The group was diverse in terms of country and profession, as well as the roles played within intermediate level wheelchair service delivery and thus ensured lively debate and discussion, but also a suitable mix of skills during all of the interactive sessions. WCRC provided the training venues for all theoretical, practical and clinical sessions and also arranged for wheelchair users to be available for all of the clinical sessions. They also provided the majority of the equipment used during the training. To ensure representation and adequate exposure to available low cost products, in addition to the locally available posture support products, a number of internationally available low cost posture support devices were imported, loaned or brought with by participants. The global launch was an important event in setting a uniform global standard in the approach to providing better wheelchair services to persons with postural deviations and will be a positive catalyst for change in this field.